RSS can significantly increase website traffic. 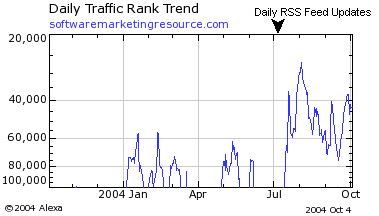 The following above Alexa graph shows traffic surges when the RSS feed on Software Marketing Resource was updated daily prior to that monthly peaks signified RSS feed updates. - The feed that corresponds with the above graphic.